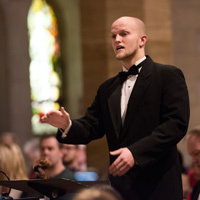 Senior music education student Cameron White conducts his work during Webster University Department of Music's "Gift to the City" concert at Christ Church Cathedral. For the eighth year in a row, Webster University music students and faculty gave St. Louis a performance to remember with the “Gift to the City” holiday concert at Christ Church Cathedral downtown. This year, one student even took a turn to conduct his own work. Webster musicians hold the popular concert in December each year with more than 100 students and faculty performing festive music to a standing-room-only audience. In a busy departmental schedule of concerts and performances, this is the largest event of the academic year for the Department of Music in Webster’s Leigh Gerdine College of Fine Arts. This year, in addition to vocalists and performers — including four department ensembles and two representatives from the jazz performance curriculum — five different student conductors were part of the program. Senior music education major Cameron White’s work from a class project last year was selected for the concert program by associate professor and conductor Trent Patterson. So, Patterson decided there was none better than White to conduct that piece himself. White wrote the piece from a junior-year project in the Choral Arranging course taught by Jeffrey Carter, professor and chair of the Department of Music. "To have it performed by our Chamber Singers at Christ Church Cathedral was truly special," White said. "The Webster University Chamber Singers is one of the finest choirs in our state and to have them perform my piece, in a concert as special as our annual Gift to the City concert, was an incredible experience." After the performance, White heard from family, friends and teachers. "To get such positive feedback after an amazing performance cemented this experience as one of the most memorable of my music career," he said. It was the second time this season that Webster University Chamber Singers have performed a work composed by one of the singers in the ensemble, Patterson said. For more on the Department of Music performance schedule and academic programs, visit webster.edu/music. To see more performances from the department's talented students, visit the Webster University Chamber Singers channel on YouTube.